(1904 - 1989) Salvador Dali was born on May 11, 1904, in the town of Figueres, close to the French border in Catalonia, Spain. His father, Salvador Dali i Cusí, was a lawyer whose strict disciplinarian approach was tempered by his wife, who encouraged her son Salvador's artistic endeavors. In 1916 Dali discovered modern painting with Ramon Pichot, a local artist who made regular trips to Paris. He had his first public exhibition at the Municipal Theater in Figueres in 1919. In 1922 Dali moved to Madrid where he studied at the San Fernando School of Fine Arts. Dali's paintings, where he experimented with Cubism, earned him most attention from his fellow students. He was expelled from the academy in 1926 shortly before his final exams when he stated that no one on the faculty was competent enough to examine him. That same year he made his first visit to Paris where he met with Pablo Picasso, whom the young Dalí revered. In 1929 he met his muse and future wife Gala, a Russian immigrant who was eleven years his senior, then married to the poet Paul Éluard. In the same year, Dali had important exhibitions and joined the surrealist group in Paris. In 1931 he painted one of his most famous works, The Persistence of Memory - sometimes called Melting Clocks or Soft Watches. The art dealer Julian Levy introduced Dali to the US in 1934, and the exhibition of Dali works (including Persistence of Memory) in New York created an immediate sensation. During the Spanish Civil War, Dali remained apolitical. As World War II started in Europe, Dali and Gala moved to the US in 1940. Starting in 1949, Dali spent his remaining years back in Catalonia, Spain. The fact that he chose to live in Spain while Franco ruled it drew criticism from progressives and many other artists. As such, it's believed that some of the common dismissal of Dali’s later works had more to do with politics than the actual merits of the works themselves. Dali’s post-World War II period bore the hallmarks of technical virtuosity and an interest in science and religion. Increasingly Catholic, he labeled this period "Nuclear Mysticism". In 1960, Dali began work on the Dali Theatre and Museum in his birthplace town of Figueres; it was his largest single project and the main focus of his energy through 1974. King Juan Carlos of Spain bestowed on Dali the title Marquis of Pubol in 1982. Gala died in 1982 and Dali lost much of his will to live and he never painted again. He spent the final years of his life in his Theater-Museum and died of heart failure at the age of 84. Dali was a versatile artist, not limiting himself only to painting. Some of his more popular artistic works are sculptures and other objects, and he is also noted for his contributions to theatre, photography and fashion. Dali was a skilled draftsman, best known for the bizarre and striking images in his surrealist work. His painterly skills are often attributed to the influence of Renaissance masters. Widely considered to be greatly imaginative, Dali had an affinity for doing unusual things to help draw attention to himself. This sometimes irked those who loved his art as much as it annoyed his critics, since his eccentric manner sometimes drew more public attention to it rather than his artwork. The artist worked extensively in the graphic arts producing many etchings and lithographs. His early work in printmaking is equal in quality to his important paintings. As he grew older, he would sell the rights to images but not be involved in the print-production itself. Naturally the earlier ones can be significantly more valuable. Dalí produced over 1,500 paintings in his career, in addition to producing dozens of sculptures, lithographs, illustrations for books, designs for theater sets and costumes, a great number of drawings, and various other projects, including an animated cartoon for Disney. His literary works include The Secret Life of Salvador Dali (1942), Diary of a Genius (1952– 1963), and Oui: The Paranoid-Critical Revolution (1927–1933). The largest collections of Dali’s work are at the Dali Theatre and Museum in Figueres, Catalonia, Spain, followed by the Salvador Dali Museum in St. Petersburg, Florida. Other particularly significant collections include the Reina Sofia Museum in Madrid, and the Salvador Dali Gallery in Pacific Palisades, California. Espace Dali in Montmartre, Paris, as well as the Dali Universe in London, contain a large collection of his drawings and sculptures. As Dali said of himself: "the only difference between me and the surrealists is that I am a surrealist." © If artwork shown on ArtFair is already sold or unavailable for immediate sale, we'll do our utmost to source a similar edition for you. ArtFair is a trading name of LeadFair Ltd. Co. Reg. Number 08565869. Reg. Address: Swift House, 18 Hoffmans Way, Chelmsford, Essex. CM1 1GU. Registered in England and Wales. VAT Reg. No. 169725662. Registered with the Information Commissioner's Office: Data Protection Reg. No. ZA025012. Artwork prices can go up or down. ArtFair offers fine art, contemporary art, urban art, pop art, and modern art through our own collection and our global network of art gallery partners, art dealers and private collections. 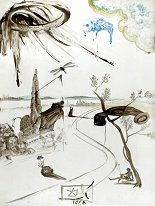 Keywords: Salvador Dali Art For Sale, Fantastic Voyage Original, Conquest of Cosmos The Last Comer of The Last Planet, Conquest of Cosmos Saturnian Giraffe.